and is our major fund raiser of the year. the Alma Doepel Voyage of a Lifetime. 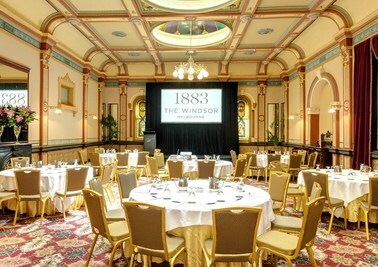 at the Hotel Windsor Grand Ballroom. is adorned with soaring stained glass domes and windows. This is the Alma Doepel's major fundraiser event for the year. Funds raised at this event represent a considerable contribution towards the restoration of the 115-year-old tall ship Alma Doepel. Tickets $220 per person or buy a table of 10 for $2,000. Sandra is the subject of “The Trauma Cleaner” by Sarah Krasnostein, which recently won the Victorian Premier's Literary award. Sandra was involved with fund-raising for youth from Westernport Drug and Alcohol to sail on board Alma and is an advocate for the Youth Sail Training program and its measurable effect on attitudes and behaviours of the young trainees. 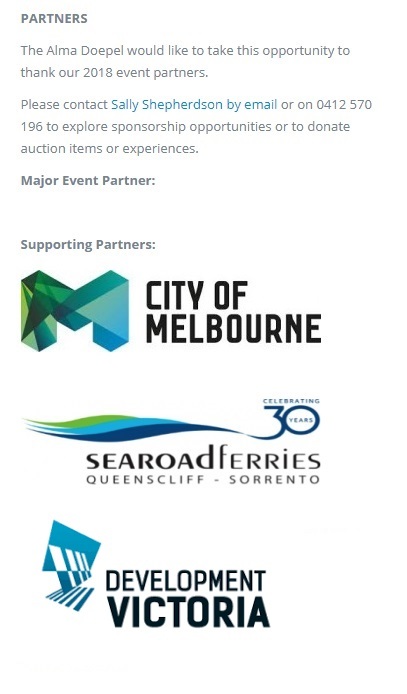 If you want to make sure the Alma Doepel with her life changing Youth Sail Training program remains in Melbourne's Docklands, please support our lunch. If you would like to be one of our sponsors for the lunch contact Sally Shepherdson on 0412 570 196. Your support will ensure we deliver a memorable event and raise substantial funds towards returning Alma Doepel to her vital Youth Sail Training program. If you can't make the lunch, you can always make a donation instead. Speak to Sally.